It’s funny peculiar that within a week of downloading one of those super apps that lets you listen to any radio station in the world including police scanners, I ended up doubling down on KALX. Isn’t that always the way with apps and smartgadgets? You get one, play the hell out of it for eight hours straight until your brain is good and spun, and then sit around the rest of the day on an emotional sugar-crash, hating yourself. After the initial feeding frenzy at the limitless radio station buffet, I began to dread turning on the app and getting sucked into the screen-tapping vortex, forced to make decision after decision in order to arrive at my optimal radio station for that particular moment: First choose one format over the others; now pick a category, and now a subcategory–choose wisely with all these windows because once you tap it open you can’t go back; now scroll through the rolodex of stations until you find one that catches your eye. Are you sure that’s the one you want? You sure?? Is that really what you want to hear, or are you just settling for what’s there? Because if you are just settling, you owe it to yourself to go back and start all over again. There really is such a thing as having too much freedom of choice. 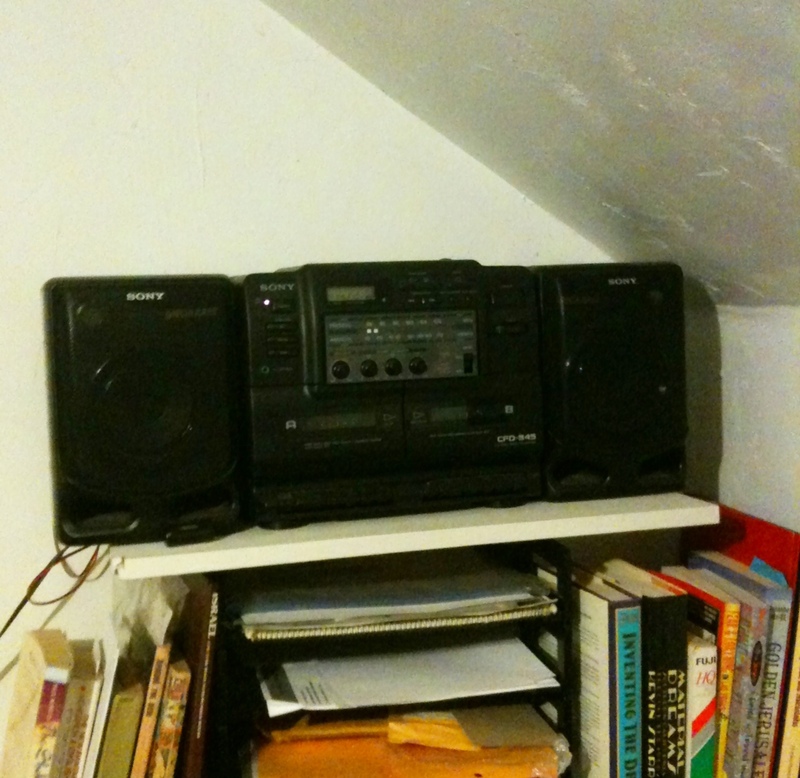 Suddenly I rediscovered my old 20-lb boom-box that had been sitting quietly on its shelf in the corner this whole time. I tentatively pressed the On button to see if it still worked, and voila, the console crackled instantly to life, already tuned-in to KALX just as I must have left it when I went digital. Suddenly, I forgot all about this app that turned my phone into a DefCon listening station and fell in love all over again with the idea of powering on my boom box and having an instant connection to a world-class radio station that also happens to be my community station. Here I am sitting in my basement workspace, hiding from daylight, listening to some student or fellow community-member broadcasting from an underground control room just a few miles away. It feels like community. The fact that I could still listen to community radio like KALX the old-fashioned way in this era of cheap thrill gadgetry made me want to do it; both community radio and the boombox have continued to serve me well ever since. Just tonight a public service announcement for Alameda County read by a KALX deejay helped resolve an issue that I had all but given up on: namely, where to dump my stash of used batteries. It would seem to be a straightforward issue in a city like Berkeley, which gave the nation its first handicapped ramp and is understood to be at the forefront of progressivism in all its forms. I’ve lived here since 2005 and it has long been made clear to me that disposing of used batteries in household trash is against the laws of Berkeley and of nature. So I saved my used batteries, and saved them, and saved them, waiting for the advisory I was sure would be coming that would tell me where to properly dispose of these dead AA’s. The years came and went and no information was forthcoming. My stash of dead batts was almost as big a breadbox now and my house wasn’t much bigger than a bread delivery van. This was getting serious. I had a potential environmental felony on my hands. I decided to become pro-active. I took to the web and found Berkeley’s official city pages, which featured clickable links for household waste disposal. However, the links led to geocities-era web pages for services that seemed to be long out of business. That was an olympiad ago. The KALX announcer has just now made me aware of stopwaste.org, Alameda County’s go-to page for recycling questions and answers. A perusal of the website does give me answers on where to recycle batteries. Sort of. More like leads than answers. They list retail chains that accept batteries for recycling, without telling you exactly who, when, and where to go. They also mention a facility on Seventh Street down by I-880 that accepts household batteries. But based on gut feeling, I figure if I head down to any of these locations with my pillowcase of batteries, the odds are less than 50/50 of the transaction being successfully completed. Let’s do some more math here. If I’m having this much difficulty finding a place to dump my Duracells, what are the odds that the rest of Alameda County is complying in a lawful and responsible manner? Considering that approximately 100% of Alameda County households discard batteries each year and that locating a facility that accepts these batteries is like cracking the DaVinci Code, not to mention the effort involved in getting to one of these not exactly BART or AC Transit-adjacent locations, it seems like there’s got to be a better way. Everyone goes through batteries. Throwing them away is illegal and immoral. Yet Alameda County makes it prohibitively difficult to do the right thing. Does the county really think that people aren’t just tossing their coppertops out with the banana peels and coffee grounds?